The title of the presentation is “Come Unto Christ and Be Perfected in Him” and is based on Moroni 10:32 from the Book of Mormon. 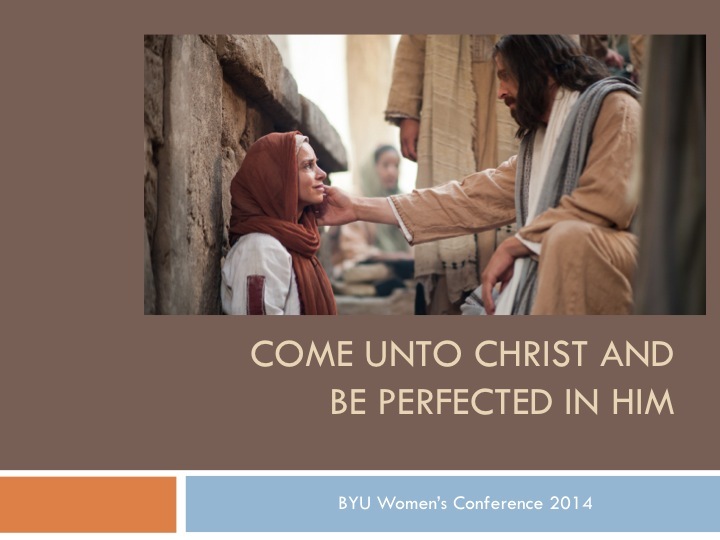 BYU Women’s conference gave me permission to share the presentation, but if you do quote it, please give the proper credit to the conference and the speakers, and if you wish to use it in any other way, please ask. Thanks. Thank you! Those were beautiful insights and I’m sure I’ll be thinking of it a lot. I do want to be acted on by Him! Hey, Stephanie, I’m new to this blog. Good stuff. Unfortunately, I am sad to say the ad generator or whatever it is called on each page I visited has offensive sexual images and headlines. Just saying. I’m assuming you have no control over these ads other than deleting. They are really horrible. If you saw an inappropriate ad, please report it to support@wordpress.com. Please include the address of the site (e.g., http://example.wordpress.com), the date/time the ad appeared, and a screenshot of the ad. I can never see the ads from my own account, so I don’t know how I could report them myself, but I’ve contacted someone to ask. Feel free to email the account and report what happened, and I appreciate your telling me about it.